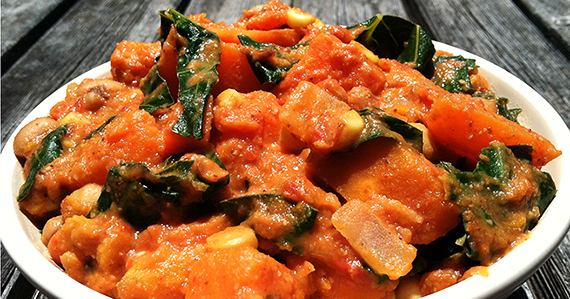 African Yam Stew ~ Amazing, Spicy, Sweet Peanut Buttery YUM! This is divine! I made it two nights ago and was crazy over the depth of flavor it has. The small amount of peanut butter truly added this whole level of yum, beyond the awesome spices it has. I have to say the next time, I would half the recipe because it simply made too much for just the Mr. and myself. The girls tried it and well… not so much mom! Perhaps the flavors are just too grown up for them, yet. Enjoy! Two popular vegetarian soups of Central Africa were the inspiration for this stew. In this region, sweet potatoes, beans, chili peppers, onions, ginger, garlic and peanuts are common ingredients. The peanut butter makes this a creamy stew, but there is only a small amount per serving. To decrease the richness serve over a whole grain or use only ¼ cup of peanut butter. Feel free to kick up the heat by using jalapeno pepper or more red pepper flakes. Add ginger, garlic, cumin, coriander and red pepper. Mix in yams, vegetable broth, tomatoes, beans and nut butter. Stir in corn and collards and cook for about 10 more minutes, until yams and greens are tender. Serve over brown rice or other whole grain. 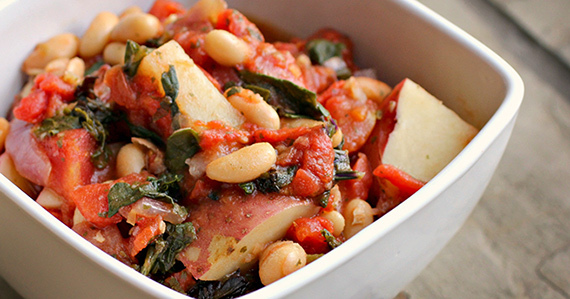 A few days ago while on Facebook, I got one of those “suggested posts” for a website ‘Forks Over Knives’ and it showed a recipe for Italian White Bean and Kate Stew. It sounded delightful and very healthy. I clicked on the link to the recipe and was happy to find this amazing site and documentary on being mindful with food choices. The documentary is quite telling and should be watched by all. Place a large soup/stock pot over a medium high flame and pour some of the liquid from one of the cans of the diced tomatoes into the pot to cover the base of the pot. When the tomato liquid starts to bubble, add the onion and stir. Lower heat a little. Press garlic into pot. Add red pepper flakes (to taste). Continue to cook and stir, lowering heat as the time passes, for a total of about 10 minutes or until onions are soft. Add the rest of the first can of diced tomatoes and the entire second can into the pot. Bring heat up to medium-high again so that tomatoes begin to simmer. Place diced potatoes, oregano and parsley into the pot and stir. Cover pot, lower heat to low and simmer for 20 minutes. Place all of the kale into the pot and cover the pot again. Let kale steam and shrink for 3 minutes. Uncover pot and stir in kale. Add Cannellini beans and stir. Taste and season with salt (or not). If potatoes are not as soft as you desire, continue to let simmer. It’s not often I get on my proverbial soapbox and rant about things. Am I passionate about certain hot issues? Yes, absolutely. Especially one of where my food comes from. But, I do try to stay aware of the origins of the food my family consumes. We hardly eat any pre~prepared foods and I buy organic when there is a choice. I choose to live as closely to the earth and our food as possible. I have to agree with that philosophy. There must be a reason that my family hardly ever gets ill and are generally in very good health, when I see pretty much all of my friends getting sick repeatedly and on some sort of medications for various “ailments.” Coincidence? I’d be hard to convince about that one. Does it cost more? Of course it does. But, I personally believe that the benefits, far outweigh the extra cost. 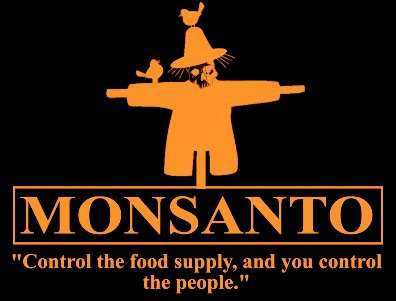 Most people don’t realize that the majority of our produce and foods, are grown from GMO seeds. But, what exactly are GMO’s? 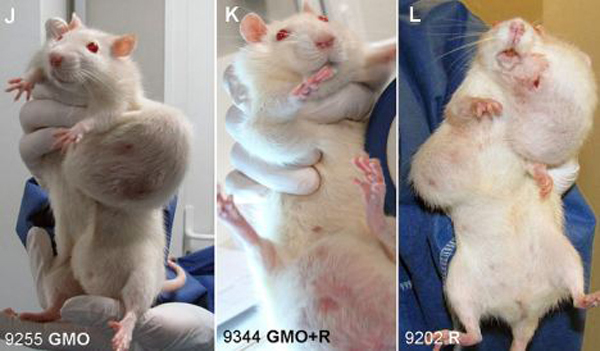 First let’s look at the lab rats that have been fed a diet of GMO seeds. Most developed nations do not consider GMOs to be safe. In nearly 50 countries around the world, including Australia, Japan, and all of the countries in the European Union, there are significant restrictions or outright bans on the production and sale of GMOs. In the U.S., the government has approved GMOs based on studies conducted by the same corporations that created them and profit from their sale. Increasingly, Americans are taking matters into their own hands and choosing to opt out of the GMO experiment. 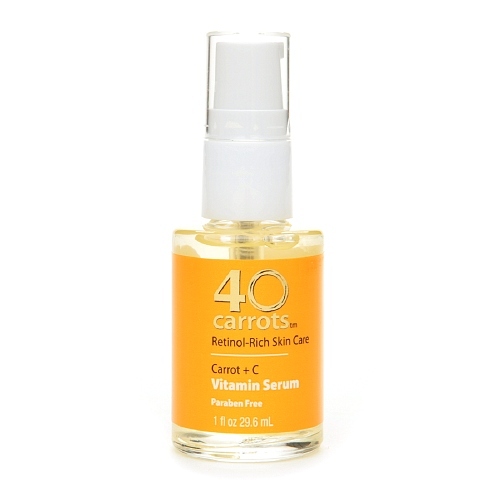 40 Carrots Serum ~ Liquid Gold Baby!!!! I started looking around on Amazon.com to see what’s out there. Something to brighten, lift or whatever, just make my skin look less haggard please! I was getting product overload within seconds, but somehow or another I did find this little gem and I have to say, I’m hooked. I’ve got lines on my forehead that I have had since high school and have used dozens of different lotions and potions. All of them were just so so and way too greasy. As I said, this was two weeks ago I bought this and I am astonished at how well this has worked. My three primary areas I am focusing on are the marionette lines near my mouth. Apparently an indicator as to which side of your face you lie on at night. I also use it on and around my eyes and my forehead. Honestly, I wished I had taken before and after photos to see the difference. But, I can say with 100% truth that my wrinkles definitely have lessened and well, last weekend at the club a twenty something guy did not believe my husband when he asked how old I was! I can live with that! Please note that some folks experience irritation with this product. I’m experiencing nothing uncomfortable, but I have noticed my skin is appearing to look a bit rosier and certainly less ruddy.